Relatives of some of the London suicide attack victims have expressed their outrage after a video message from one of the bombers was shown on Arab TV. The video showed Mohammed Sidique Khan criticising British foreign policy and saying he was a soldier fighting a war. John Taylor, who lost daughter Carrie, said it showed the bombers were "evil". Gous Ali, whose girlfriend Neetu Jain died, said Khan's message was "lies". Foreign Secretary Jack Straw said there was "no excuse for terrorism". A security assessment of the tape, in which Khan attacks UK foreign policy, was under way, Mr Straw added. 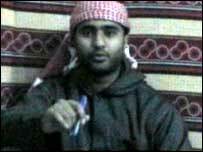 The 30-year-old bomber's message was recorded on the same video as a message from al-Qaeda's Ayman al-Zawahri. Both were broadcast on the al-Jazeera network. Mr Taylor, of Billericay, Essex, lost his daughter in the Aldgate train bomb. He said the video showed how "totally evil" the bombers were. "I believe it was a pre-planned event. We're in a war situation now and this has been coming for a very long time," he said. The Hindu girlfriend of Mr Ali - himself a Muslim who has studied Islam - was killed in the explosion on the number 30 bus in Tavistock Square. He said: "I just want to go on national television myself and expose their lies. "It's all brainwashing by some wacko scholar who believes his own version of the Koran and has made it his own battle. There is no holy war. "They have so much coverage it's damaging, yet the voices of the innocent victims are not being heard." Speaking at an informal meeting of EU foreign ministers in Newport, Mr Straw told reporters there was "no excuse, no justification for terrorism of any kind". He added: "And it happens those who entirely wrongly claim to speak in the name of Islam are mainly killing their fellow Muslims." BBC security correspondent Gordon Corera said the tape was being examined closely for any clues on the 7 July attacks, in which 52 people died after three Tube trains and a bus were bombed. Counter-terrorism sources said they were not treating the messages as conclusive proof the al-Qaeda leadership directly ordered - rather than simply inspired - the attacks, he said. Khan, from Dewsbury, West Yorkshire, was responsible for the 7 July Edgware Road Circle Line explosion which killed six people and injured 120. On the tape, he said the public was responsible for the atrocities perpetuated against his "people" across the world because it supported democratically elected governments who carried them out. "Until you stop the bombing, gassing, imprisonment and torture of my people we will not stop this fight," he said. "We are at war and I am a soldier. Now you too will taste the reality of this situation." It is not clear when or where the tape was filmed. But friends of Khan told BBC News it showed him looking significantly different than he did immediately before 7 July. They believed the message had been recorded some weeks or months before the bombings. One acquaintance, Irshad Hussain, thought it could have been recorded as long as a year ago. 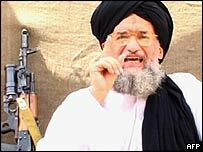 In a separate recording on the same tape, al-Zawahri said the Tube attacks were a "slap" to the policies of Tony Blair. On his tape, al-Zawahri, speaking in Arabic, said the bombings were proof al-Qaeda had moved the battle to "the enemies' land". He said: "It's a sip from the glass that the Muslims have been drinking from. He added al-Qaeda would target the "lands and interests of the countries which took part in the aggression against Palestine, Iraq and Afghanistan". Muslim Council of Britain spokesman Inayat Bunglawala told BBC News it was "obscene" to suggest justice for the people of Iraq could be obtained by an act of injustice against the people of London. "Holding all British people responsible for the Iraq war is just plain wrong - this country was bitterly divided and many millions, perhaps the majority, clearly opposed the war." Labour MP Eric Joyce, who supported the Iraq war, said people could be recruited using arguments over Palestine and Kashmir as well as Iraq. Tory leadership hopeful and former minister Malcolm Rifkind told BBC News the "widespread belief" among some Muslims that the UK government's foreign policy was directed against Muslims was wrong. "I was against the Iraq war - I'm no supporter of the government on that objective, but I do absolve them completely of any anti-Muslim objectives and I think the government has to work a lot harder to explain its foreign policy."